C & A Scientific - Premiere C & A Scientific Premiere SMP-24L Binocular Stereo Microscope, 10x Eyepieces, 20x/40x Magnification, 2x/4x Objectives, Upper/Lower LED Illumination, Battery-Powered. The C & A Scientific Premiere SMP-24L binocular stereo microscope has 10x widefield eyepieces, a fixed 45-degree angle viewing inclination, 2x and 4x objectives with 20x and 40x total optical magnification, upper and lower LED lighting, a fixed stage with dual focusing knobs on rack-and-pinion mount, a frosted 95mm glass plate with clips for holding samples, and a reversible (black/white) stage plate. The binocular viewing head has a pair of eyepieces, fixed inclination to reduce eye and neck strain, eye shields to block ambient light, and rotation capability to provide a more comprehensive view and enable sharing. The objectives are mounted on a turret to ease magnification changes. The objectives provide low magnification and a longer focal length for inspecting large-scale specimens, or specimens that require hands-on manipulation or repair, including rocks, minerals, watches, or circuit boards. The microscope has upper (episcopic) illumination that reflects light off the specimen for enhanced visibility of opaque specimens, and lower (diascopic) illumination that transmits light up through the specimen for enhanced visibility of translucent and transparent objects. The LED light source provides bright, cool light for working with temperature-sensitive or live specimens. There is a three-way switch for light sources. The frosted glass stage plate allows light to pass through from below. A stereo microscope, sometimes called an inspection or dissection microscope, has a longer working distance that enables users to manipulate the object being inspected, and is used in semiconductor and electronics industries or by mineralogists, dentists, and students when the user needs to handle or perform work under magnification, including circuit boards, rocks and gems, and dental appliances. The microscope stand is constructed of metal for durability. The microscope is approximately 12 x 4-1/2 x 7-1/2 inches (H x W x D, where H is height, the vertical distance from the lowest to highest point; W is width, the horizontal distance from left to right; and D is depth, the horizontal distance from front to back). It comes with a vinyl dust cover. Microscope Head and Optics Specifications. 2x and 4x, mounted on rotating turret. Microscope Illumination and Stage Specifications. Dual knobs on rack and pinion mechanism. Fixed, frosted 95mm stage plate, reversible (black/white) stage plate, two stage clips. 12 x 4-1/2 x 7-1/2 inches (H x W x D). Microscopes are instruments used to enhance the resolution of an object or image. Types include compound, stereo, or digital. Compound microscopes use a compound optical system with an objective lens and an eyepiece. Stereo microscopes show object depth in a three-dimensional image. Digital microscopes are used to display an image on a monitor, rather than looking through a lens. Microscopes can have monocular (one), binocular (two), or trinocular (three) eyepieces, with varying magnification abilities. Magnification ability refers to the size of an image. Resolution, also known as resolvant power, refers to the clarity of the image. The interaction between field of view (FOV), numerical aperture (NA), and working distance (WD) determines resolution. Microscopes can control magnification through a fixed focus, or through a range of adjustments. They can also utilize LED, fluorescent, and mirror light sources to help control viewing capabilities. Microscopes are widely used in education, lab research, biology, metallurgy, engineering, chemistry, manufacturing, and in the medical, forensic science, and veterinary industries. C & A Scientific manufactures and distributes medical and educational products. The company, founded in 1988, is headquartered in Manassas, VA. What's in the Box? 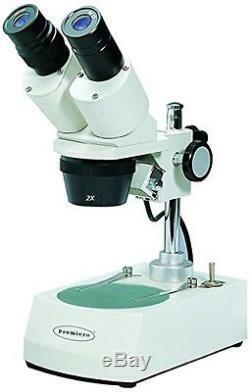 C & A Scientific Premiere SMP-24L microscope. Binocular head with a pair of 10x widefield eyepieces, 45-degree vertical inclination to reduce eye and neck strain, and 360-degree rotation capability to provide a more comprehensive view and enable sharing. 2x and 4x objectives on a rotating turret, 20x and 40x magnification, and longer focal length for inspecting large-scale specimens. Upper and lower LED lighting with three-way switch. Fixed stage with dual focusing knobs on rack-and-pinion mount, frosted 95mm glass stage plate with clips for holding samples, and reversible (black/white) stage plate. Product Dimensions: Width: 11.40 Length: 13.40 Height: 6.10. If there is any problem we will gladly accept the return. So make sure not to throw anything away before you know the item arrived in good condition! Happy customers are our first priority. Fortunately we manage to make almost all of our customers happy customers. However, erring is only human, and a problem can always arise. The item "C & A Scientific Premiere C & A Scientific Premiere SMP-24L Binocular Stereo" is in sale since Monday, September 12, 2016. This item is in the category "Business & Industrial\Healthcare, Lab & Life Science\Lab Equipment\Microscopes". The seller is "universe-deals" and is located in USA. This item can be shipped to United States, to Canada, to United Kingdom, DK, RO, SK, BG, CZ, FI, HU, LV, LT, MT, EE, to Australia, GR, CY, SI, to Japan, to China, SE, KR, ID, to Taiwan, ZA, TH, to Belgium, to France, to Hong Kong, to Ireland, to Netherlands, PL, to Italy, to Germany, to Austria, IL, to New Zealand, PH, SG, to Switzerland, NO, SA, UA, AE, QA, KW, BH, HR, MY, CL, CO, CR, DO, PA, TT, GT, SV, HN, JM.